The lack of sphere is definitely a problem, since I believe all collision is spherical. I have a cube demo mod package which demonstrates this, since you can see the collision sphere surrounding the cubes when you spawn them. Anyway, I don't think face size is the cause of the problem; Oni's collision is fairly precise even if it is simplistic, and my spheres have plenty of polys in them, yet they can be pushed perfectly well from any angle. I will do a test project level with everything set up so you can easily check what may be the problem. First thing I discovered was the name of the object in the dae was "SketchUp", so in the level I had M3GMSketchUp.oni not M3GMboxing_bag.oni. Correcting this, produced the file M3GMboxing_bag.oni However, Oni still crashed on me. Instead, I used Sketchup 8.11 to export the dae and now I have the movable boxing bag in game. At the moment I cannot explain why this happens, just that it works for me. How did you fix this? You just renamed the file or did you do it in sketchup? If this is the case where do I change it? FYI, your original model was textured on both sides of the face, make sure you only texture the front face. I've been very busy and I wasn't able to test this out. Once I can I will tell. Thanks for the help. Hey guys here's a tip. When I tried to add glass to my level the BNV where that glass was located was marked automatically by OniSplit as impassable. This usually what we want, but what if we want that the characters can walk over the path that is covered by the glass? Well I found a work around that can force OniSplit to generate that path as passable (in bnv). All you need to todo is add the GunkFlags "Stairs" to the dae file that contains your glass objects (in my case I used a separate dae / sketchup project file for the glass in the level). Note the GunkFlags "Stairs" inside the import of glass dae file. BTW. When are you going to release this level to the public? I'm almost finished with the fourth arena, I'm gettings some random crashes on this one for which I couldn't find the cause. Maybe I'm using too many particles? Some bsl bug? Not sure yet. After that I will start working in the bonus stuff which will add some more interesting things to the level and this stuff will take a while to complete (it requires modelling, texturing, particles, bsl, sound work). Either way it will take at least more a couple of months to finish (depending how much free time I am able to allocate to the project). I would say that it is around 60% complete by now. 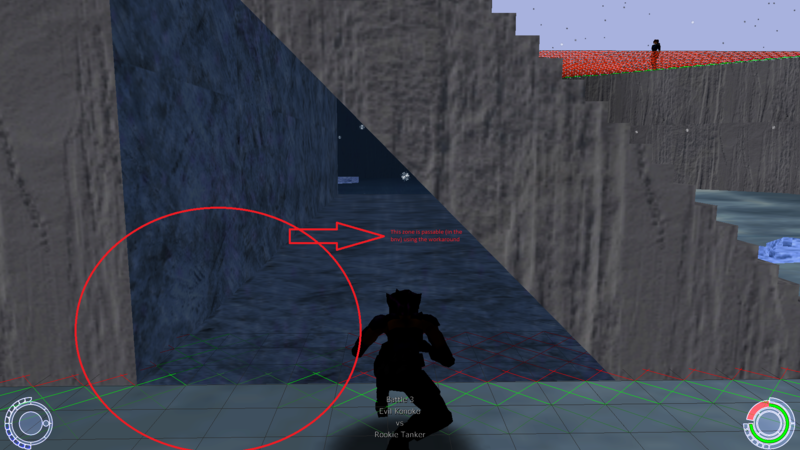 When adding the "Danger" flag to a dae object in your level you may need to increase its size a little in the height (even if is a very small amount) otherwise OniSplit may apply the "Danger" flag in other polygons above or bellow your "Danger" dae object, this affects badly your pathfinding.